This massive body of water is some 20km south west of Harrismith on the road to KwaZulu-Natal via Oliviershoek Pass. The land surrounding the dam is a nature reserve administered by the Free State Province, all amid magnificent mountain scenery. The reserve itself offers self-catering chalets plus caravan and camping facilities (phone 058 62223520) and there are a number of other establishments nearby offering accommodation from upmarket to fairly rustic. As this reservoir is some 16 km long and 7 km at it's widest and has a rugged shoreline it is certainly advantageous to have the use of a powerboat to reach many of the choice fishing spots. There is a good slipway for launching boats at the northern point of the provincial resort. However care should be taken when using a boat as Sterkfontein is notorious for stormy conditions with high winds and surprisingly big waves which often develop within a very short period of time. The fishing for yellowfish is arguably some of the finest in the country particularly as the very clear water lends itself to excellent sight fishing. Most of the yellows are Orange/Vaal smallmouth, but there is a very small population of Orange/Vaal largemouth present. There are also large numbers of sharptooth catfish, some very big, as well as common carp. 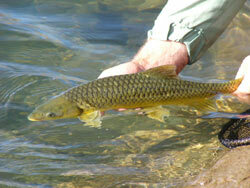 Both these species are also targeted by fly fishers as well as the Orange River mudfish. The small banded tilapia is sometimes taken on tiny flies and there are growing numbers of Large-mouth Bass. Bass should be taken out, they make superb eating and are soon going to pose a threat to the indigenous species that are present in the dam. 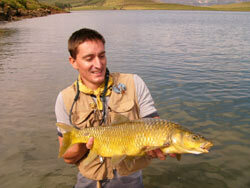 The yellows of Sterkfontein, which are the main quarry of the fly fisher, are highly nomadic. Breeding season and food supply mainly drives this behaviour. Breeding occurs primarily when water temperatures are highest and the summer rains allow these fish to migrate up the three larger streams. This is mainly between late November and mid January. This is often considered the best fishing time for yellows but the pre-breeding period of September to November and the post-breeding months of mid-January to April can be equally good. In general, yellows feed very little during the winter from about late May to mid- August and in any case fishing during this time can be unpleasant at this high elevation (1 800 metres) with frequent snowfalls on the surrounding mountains and right down to the shoreline on occasions. During the breeding season there tend to be higher concentrations of yellows in the southern part of the reservoir, particularly close to where the three main breeding streams enter, while outside this season they are more dispersed throughout the impoundment. It is most important to note that to protect breeding fish. 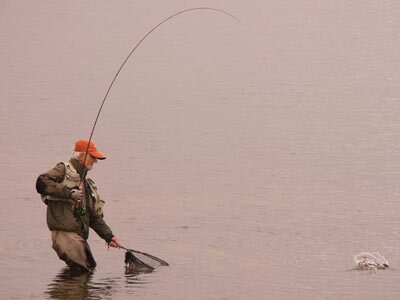 Flyfishermen are asked to stay away from any areas where breeding fish are observed. Please do not wade on these gravel beds and don't walk the banks as this disturbs the fish, just stay away. Although provincial regulations permit the killing of 2 smallmouth per day it is strongly recommended that all smallmouth yellows be returned to water unharmed. This should be done employing the usual precautions of barbless hooks, nets without knots and if you have to handle the fish this must be done with wet hands. 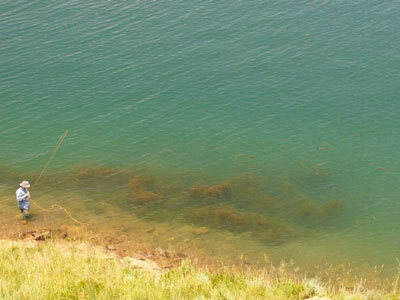 Breeding areas available at Sterkfontein are very limited for this species and there has been considerable illegal killing of yellows during spawning so it is vital that we conserve our stock of fish. Under no circumstances should largemouth yellowfish be killed as they are classified as 'vulnerable' and enjoy protection of the Free State provincial regulations. In order to access information of a particular fishing spot please click the relevant area on the map. All information supplied by David Weaver. For up to date information or for guiding services you may call David on 083 3034230.